The Seabourn Sojourn is the second of the trio of larger mega-yachts that Yachts of Seabourn is adding to its fleet over three years and follows hot on the heels of Seabourn Odyssey. In some ways, Sojourn’s launch was always going to present something of a challenge to Seabourn, as it was Odyssey that set the standard last year. The ship won numerous plaudits for its stylish new design and luxurious surroundings while, at the same time, maintaining Seabourn’s renowned service standards. In many ways, the Sojourn cruise liner is a carbon copy of her older sister, but there are a handful of differences. For instance, some of the rustic colour themes and complementary objets d’art running through the ship have been changed, giving Sojourn a subtly different feel. But it’s in the spacious spa that guests will spot the main alterations. The bubbling thalassotherapy pool that is the centrepiece of this pampering haven on Odyssey has been replaced by a Kneipp Walk pool offering holistic warm and cold water therapy for guests keen to wade through it. The number of Spa Villas has also been reduced from two to one, enabling Sojourn to offer a more spacious relaxation area on the spa’s upper deck. Aside from this, little else has altered – but such is the grace and beauty of these new Yachts of Seabourn cruise ships, it really doesn’t matter. After all, if you hit a winning formula, why change it? Last year’s introduction of Odyssey has been credited with opening the upmarket cruise line to a whole new audience of first-time and younger Seabourn customers – something the cruise line is keen to build on. And there is much to attract them as Seabourn has been clever enough to combine its strongest attributes – namely service and cuisine – with larger vessels offering more space, stylish designs and the latest facilities. At 32,000 tonnes, Sojourn is three times larger than Seabourn’s original trio of vessels – Seabourn Legend, Seabourn Pride and Seabourn Spirit – and it takes more than twice as many passengers; 450 compared with 208. And while Seabourn Sojourn is still small enough to call at ports and harbours that larger ships cannot squeeze into, its increased size has ushered in more expansive deck space, additional restaurants, the largest spa of any ultra-luxury cruise ship and some of the biggest suites with spacious verandas to match. The main deck area around the picturesque pool and twin hot tubs oozes laid-back luxury and sophistication. This is highlighted by a subtle palette of browns and creams with plush sun loungers and cosy sofas, framed by floaty drapes around the edge of the deck. The guest accommodation has seen some of the biggest changes over Seabourn’s older cruise ships, with 90 per cent of suites having their own private verandas. Even the smallest suites stretch for a lavish 295 sq ft, while verandas are from 65 sq ft making them perfect outdoor venues for Seabourn’s in-suite dining programme which covers all meals, and dinners that are served course by course from The Restaurant. There are 22 breathtaking Penthouse suites, covering 450 sq ft and with a novel layout whereby the bedroom area is surrounded by glass walls, enabling occupants to gaze out across the ocean without moving a muscle. These are complemented by beautiful granite bathrooms, walkthrough closets, and 100 sq ft verandas. However, the crème de la crème is the fabulous Wintergarden Suite with acres of space (all 1,182 sq ft of it) that encompasses separate dining and lounge areas and a fabulous glassenclosed solarium with a stand-alone bathtub, giving fabulous views off the side of the ship. Next to that are not one but two verandas, giving an extra 215 sq ft of space and equipped with plush sun beds and a table and chairs. Another high point of Sojourn is the beautifully-designed main dining venue, The Restaurant, which is a fitting match for Seabourn’s rich vein of gourmet cuisine, developed under the eye of American celebrity chef Charlie Palmer. With its ivory drapes and sparkling chandelier as the centrepiece amid elegant circular tables and ovalbacked chairs, this has to be one of the most stylish dining spots afloat. Another favourite of mine was Restaurant 2; a bold, burlesquestyle venue full of black leather and red velvet with heavy drapes and a lowered ceiling giving a more intimate ambience. This is where guests can enjoy exquisite tasting menus paired with suitably matched fine wines. The Colonnade is a new addition to both Sojourn and Odyssey; a fresh and airy informal eatery with seating inside and out. Then there is the poolside Patio Grill, the place for casual meals during the day or dining under the stars. 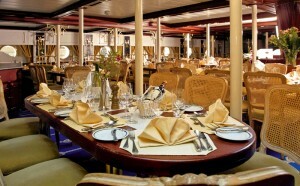 Seabourn Square is the central point of the ship, featuring cosy chairs and a relaxed atmosphere. This innovative concierge lounge is the place to book excursions, surf the Internet on the communal computer terminals, choose a good read from shelves full of books or simply have a coffee and soak up the views from the outside terrace. Alternatively, hide yourself away in the 11,400 sq ft spa, which spans two decks and is said to be the largest on any ultra-luxury vessel. Guests can take their pick from the gym and fitness room, complete with a Kinesis Wall and an adjacent area for Thai massages; a full-service salon complete with its own nail-buff bar; and a long list of relaxing and healing spa treatments. Guests booking a treatment can spend an hour in the spa deck’s ‘serene’ area. Alternatively, passes are available for $180 single or $300 for couples, per cruise. The Spa Villa, which comes with treatment beds, a huge bath and a daybed, plus a dining and lounging area, can be hired from $650 for two and a half hours, for two to four guests. It comes complete with a package of treatments. When it comes to evenings, entertainment on Sojourn is spread through six lounges and bars, but most of the action centres around The Club with nightly dancing and the nearby casino. The Grand Salon is the venue for cabaret and live bands, while the Observation Bar is the place for quiet conversation to the musical backdrop of a live pianist. SAILS TO: Northern Europe (summer 2010); Mediterranean (autumn 2010); Caribbean (winter 2010); world cruise (January 2010 to April 2011); Mediterranean and Baltic (summer 2011). GUIDE PRICE: A nine-night Mediterranean sail starts at £2,449 in October. INCLUDED: Tips, all meals and beverages. EXTRAS: Spa treatments, excursions, Internet access and laundry. SUITES: 225. All of the staterooms on the ship are suites and 90 per cent of them (197) have their own verandas. There are 13 categories, with the smallest measuring 295 square feet and the largest 1,182 sq ft. Verandas add between 65 sq ft and 505 sq ft of outdoor living area, making them spacious enough for al fresco entertaining. The main fine-dining and gourmet venue courtesy of chef Charlie Palmer. An indoor/outdoor restaurant serving breakfast, lunch and dinner in an open-kitchen style. Avant-garde dining serving carefully selected food and wine pairings with special tastings and themed menus. For poolside casual dining at breakfast, lunch and dinner. In addition, freshly-baked pastries are served in the morning and gourmet pizzas in the afternoons. TYPICAL PASSENGER: Refined, affluent couples or single travellers from mid-40s upwards.